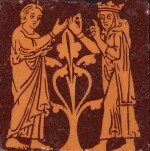 Tiles showing Edward the Confessor (c. 1003-1066) giving a ring to a beggar date back to the Middle Ages. 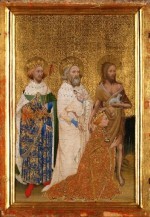 One famous very early example can still be seen on the floor in the Chapter House of Westminster Abbey which can be dated to the middle of the 13th century. The story shown on these tiles tell the wonderful tale of the Saxon King Edward who when riding past a church in Essex was asked for alms by an old man. 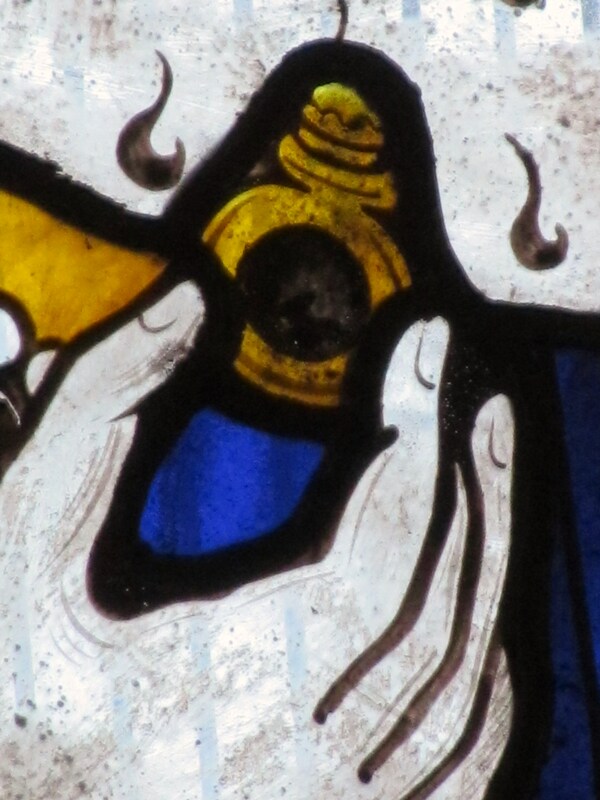 As the king had no money on him he drew a large ring off his finger and gave it to the beggar. 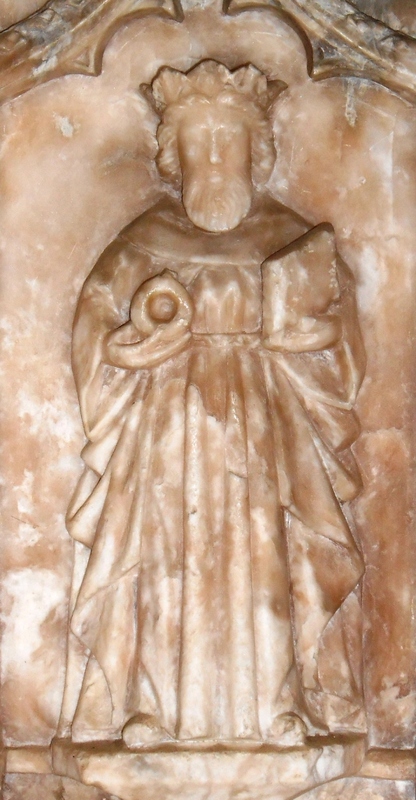 Several years later two pilgrims were travelling in the Holy Land and became stranded. 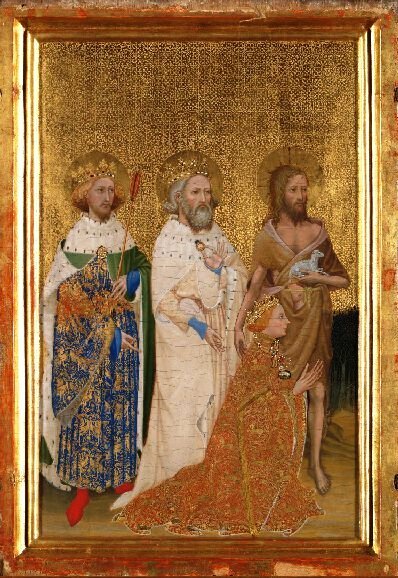 They were helped by an old man and when he knew they came from England he told them he was St John the Evangelist and asked them to return the ring to King Edward telling him that in six months he would join him in heaven. 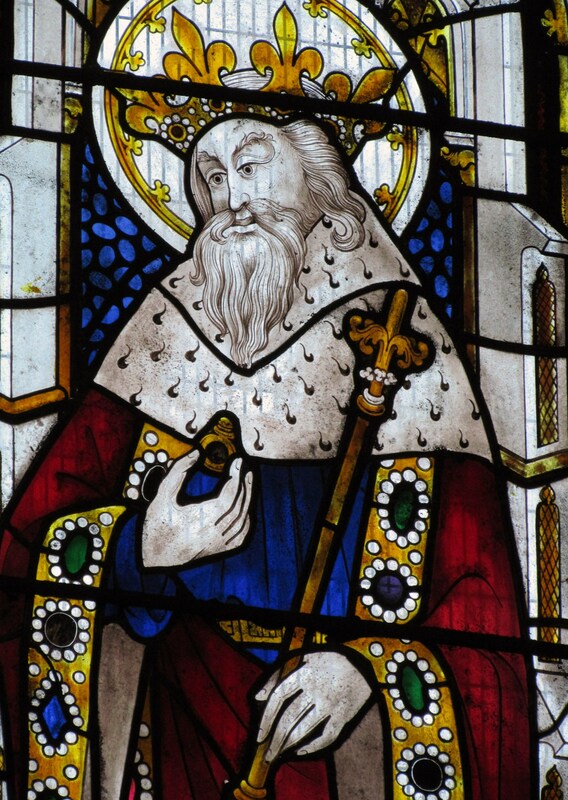 When King Edward died he was buried at Westminster Abbey where his shrine became a focal point for pilgrims and he was canonised in 1161. The ring became Edward the Confessor’s symbol or emblem and he is often depicted in medieval painting, stained glass and sculpture holding a large ring. 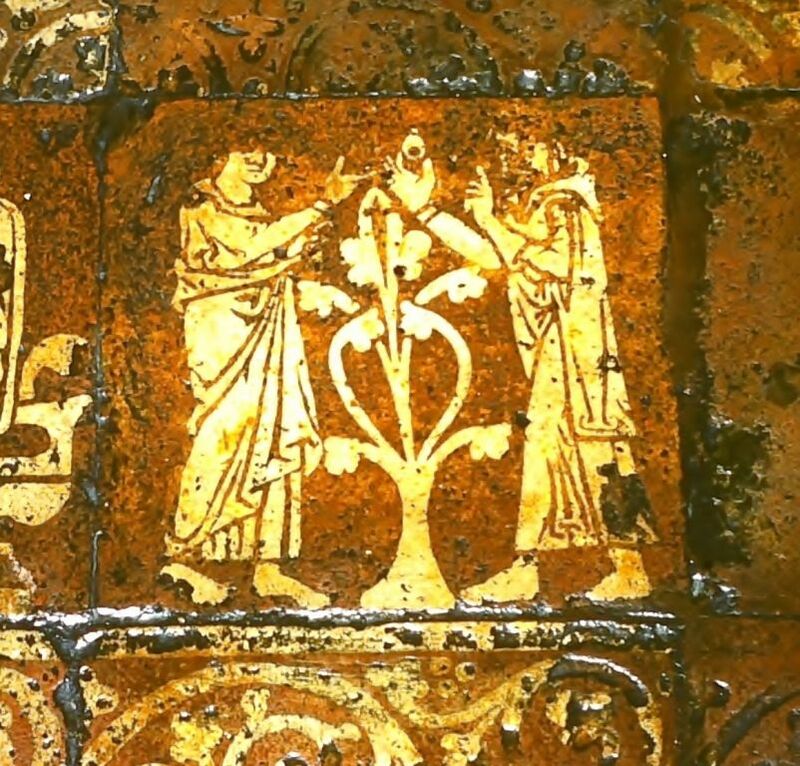 When in 1841 the architect Lewis N. Cottingham ‘rediscovered’ the 13th century medieval floor in the Chapter House of Westminster Abbey, it created a stir amongst antiquarians. 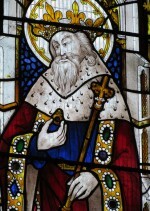 Replica encaustic tiles of the floor (including the tile with Edward the Confessor) were made by the Victorian ceramics manufacturer Hebert Minton in Stoke-on-Trent to repave the floor of the medieval Temple Church in London which was being restored at that time. 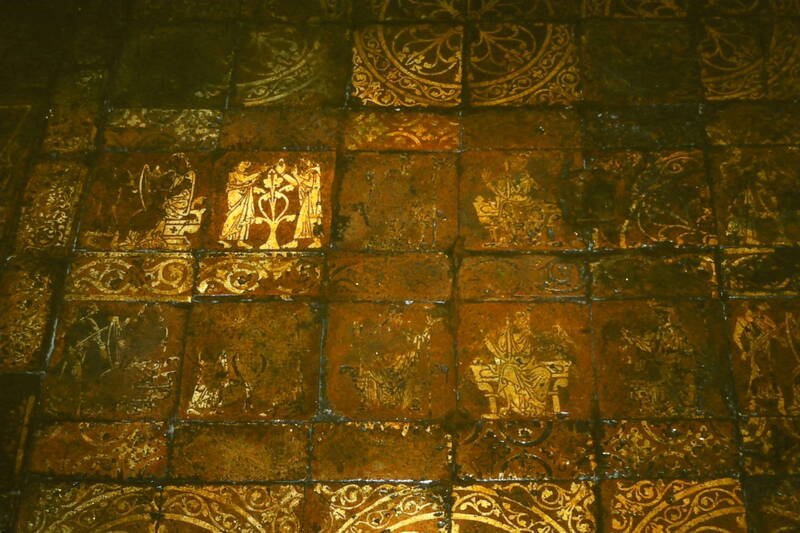 The replica tiles made by the firm Minton & Co. of the Westminter Abbey Chapter House floor proved also popular for the restorations of other churches and they were kept in production until the 1870s. Examples can be seen at St. Mary’s Church in Shrewsbury and St. Laurence Church in Tidmarsh, Berkshire. The firm Minton, Hollins & Co continued to make these replica encaustic floor tiles after Herbert Minton’s death in 1858 and they also made polychrome relief and transfer-printed wall tiles showing the design of Edward the Confessor giving a ring to a beggar. 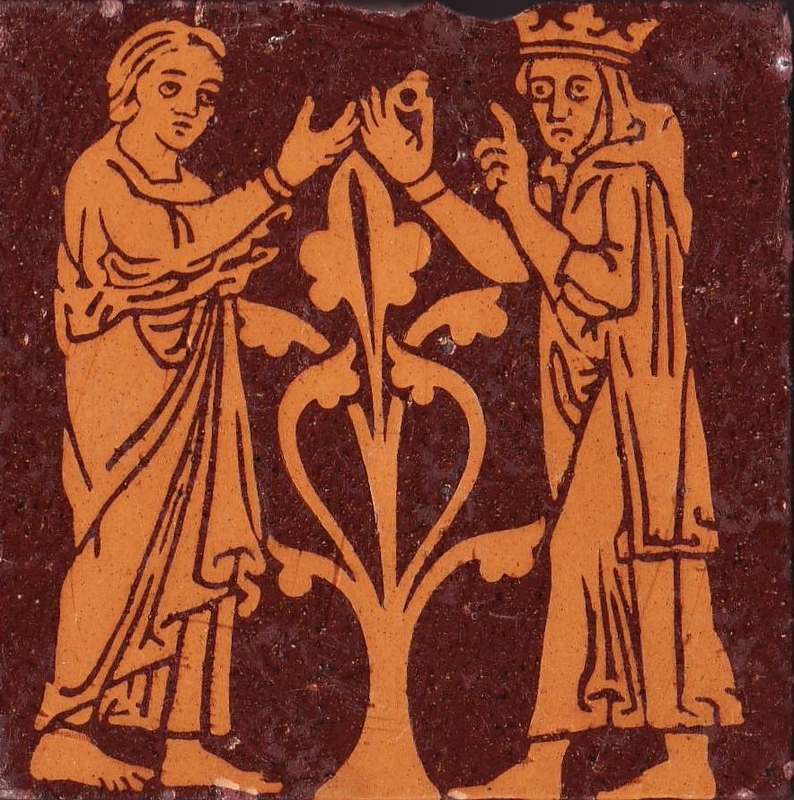 For a full account of the history of this particular tile design see Hans van Lemmen ‘An iconographic and iconological approach to tile analysis based on a study of the Edward the Confessor tile at Westminster Abbey in Journal of the Tiles & Architectural Ceramics Society, Vol. 12, 2006, pp. 3-8.